A Miracle of Science: Witness the SUCCESS of my CALCULATIONS! And so we return to the real reason you folks are here - Mark's artwork - which is looking mighty sharp and polychromatic, if I may say so. You'll note on this page that the Vorstellen Police HQ building has "Vorstellen Polizei" written on its side. Vorstellen is a German word which can (roughly) mean "to imagine," "to signify," or "to put forward," and polizei is German for "police." 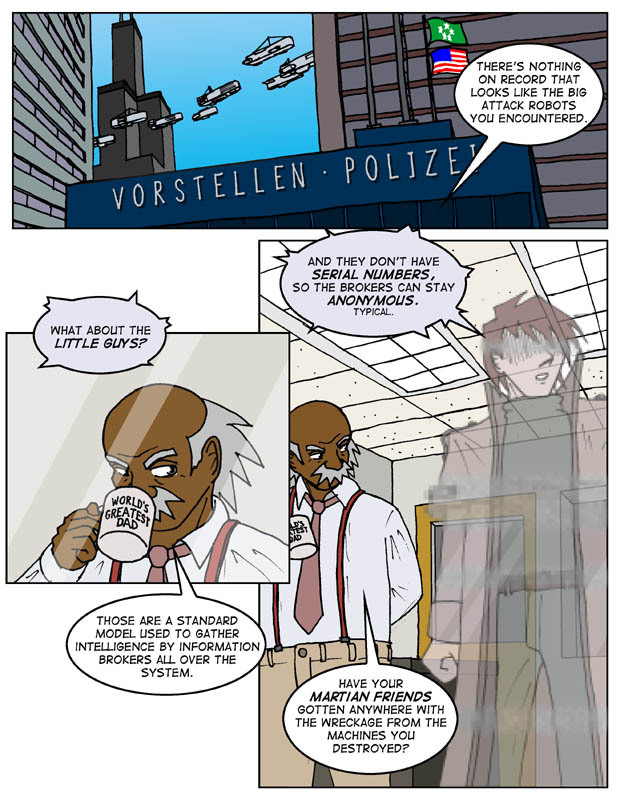 The Vorstellen Police are the patrolmen of the imagination and the guardians of new meanings - in other words, the memetics cops. Welcome back, everyone! And welcome to part two of A Miracle of Science. I'm your lead artist, Mark, and with my good friend DJ Kilgannon over there on words we're more than ready to lay down some mad science on you. In Chapter Two, our heroes will travel to many interesting planets and moons, our main villain will make his presence known, and I am assured there will be at least one space battle, so plenty of excitement waiting in the wings there. On the art side, you may have noticed that the comic is in color now. It's sort of an experiment; if it turns out to add too much prep time, we may go back to black and white. But so far, so good. I'd be interested to hear what people think of the new art style as the chapter progresses; that big ol' email button over there is always ready in case you want to throw in your comments. Hint. On a personal note, I just moved to Chicago (home of MoS's Vorstellen Police) and I'd like to say I've personally scouted out the locations for the comic here, except that wouldn't be true. All I can say is that the VP headquarters is located somewhere near the western side of the Loop; beyond that it's all rather hazy. I did look at the Sears Tower this afternoon so I could draw it more accurately, though. Heh... well, I suppose this is not actually relevant to the comic at all. I just wanted to brag.